Apple Tree Learning center appreciates your support! To get in touch with us regarding a monetary donation, please use the form below or give us a call. Apple Tree Learning Center is an IRS 501 (c) (3) approved non-profit organization and all donations are tax deductible. 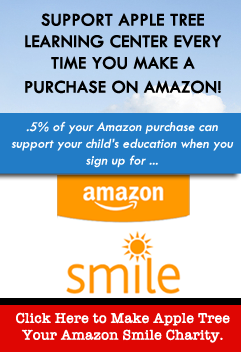 By choosing Apple Tree Learning Center as your Amazon Smile charity, you can give while you shop online–no extra charges. .5% of your purchase goes straight to supporting our mission to provide personalized developmental child care in a distinctively Christian environment. It’s easy! Just click the link below to sign into your Amazon account and get started. Thank you! Summer Camp Fun IN THE WILD! Safety First: What’s Your Plan? Click the button to get our newsletter in your email each month.